The washable and reusable nursing pads are leak proof with the TPU waterproof fabric on the outside. On the inside the soft bamboo terry cloth that comes into contact with you, while a microfiber in the middle provides the absorbency. They are 11cm in diameter. 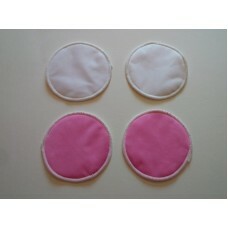 In this listing you will receive 1 pair (2 pads) of the color you select below. Please note if they are order alone they will be shipped with Canada Post letter mail.